Family Dentist Fort Collins: Check Out These Great Reviews! In today’s world, online reviews are almost as powerful — if not more so — than word of mouth when it comes to finding a new dentist in Fort Collins. In some ways, that’s a good thing for patients. You can see exactly what’s going on at your local dentist of choice from multiple people, rather than just from those you know. Personally, we think we have the best patients in the world. When you’re at Shores, you’re family. We are so grateful for our positive online reviews. It is because of those who take the time to share their experience that new patients feel confident about coming here for the first time. So, today, we’d like to take some time to say “thank you” to a few of those who have shared their feelings about Shores! But first, for more Shores Family Dentists ratings, feel free to check out some reviews on our Facebook page, Yelp, and RateABiz. And, of course, don’t forget to schedule a dental checkup! Sometimes dental issues sneak up on you, so having the best dentists in Fort Collins perform an examination can prevent any sneaky issues from getting bigger! Hey, Greg! Thanks for taking the time to leave a review! Whether you’re a regular patient or trying to find an emergency dentist to get you in on short notice, we’ll always try to accommodate people when they’re in any sort of dental distress, even for minor issues. 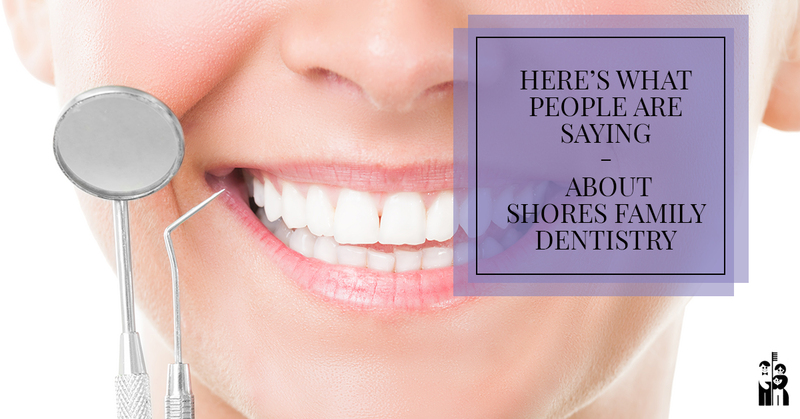 Thanks for choosing Shores as your family dentist! Jenny, we appreciate your review so much! While sometimes things pop up that might result in a short wait, our goal is for that to not be your regular experience when you come to Shores. We hear from a lot of people, just like you, that they actually kind of enjoy coming here! Dentists don’t go to school expecting that praise as we know a trip to the dentist isn’t always pleasant. The fact that several people have told us they enjoy their trip to our dental clinic and look forward to their next appointment makes us feel like we’re doing something right! Thanks for entrusting Dr. Vogl and our team with your dental health and that of your family! Cassie, we can’t thank you enough for your review. We take extraction very seriously and try to be conservative in our practice and save teeth whenever possible. However, wisdom teeth, as you know, often need to come out. We’re glad that you had a good experience and we hope your review encourages others to come in for a checkup to determine whether their wisdom teeth need to be removed. The longer you wait, the more time your wisdom teeth have to make themselves comfortable in your mouth, so we encourage those reading this to come in for an exam if you think you might need your wisdom teeth out. Hey Theresa, thanks for your review! We wish we could go back in time to when Dr. Siegmund opened Shores in 1985 and tell him that he would have patients stick with him for nearly 30 years just to see the look on his face! Lifelong patients are every dental practice’s dream, and we’re so thrilled you and your daughters entrust us with your dental care. When parents trust their dentist with their children’s’ dental health, and in turn, those kids grow up and still want to come back as adults… that’s what it truly means to be a family dentist! Thank You To New And Regular Patients! Whether it is your first time at Shores of you’ve been coming here for 30 years, we want to sincerely say “thank you.” It is because of you that we get to keep doing what we love and expanding as a practice. If you’d like to come see what the hype is about — and do something good for your teeth while you’re at it — please feel free to make an appointment with one of our dentists. Whether you just need a cleaning or are having some more serious issues, we’d love to help you and your family on your way to good oral health.